Freshmen in the National Hockey League have had quick starts before. In recent years, Jordan Eberle of the Edmonton Oilers and the New York Rangers’ Derek Stepan have both made great impressions in their first games. Eberle scored one of the goal’s of the season, and Stepan came out and fired a hat-trick in his. Vladimir Tarasenko of the St. Louis Blues is off to a very similar start. Ask those who’ve been around him for a while, and they’ll tell you it’s no surprise. “He’s the complete package,” said Blues teammate T.J. Oshie after their first game of the season, a 6-0 rout of the Detroit Red Wings. During that victory over Detroit, Tarasenko scored a pair of highlight-reel goals, and they certainly caught people’s attention. In their very next game, a matchup against the Predators in Nashville, Tarasenko continued his point-producing ways, scoring another goal while also dishing two assists. A wrister from the right circle in the first period got past Nashville goaltender Pekka Rinne, and Tarasenko proved his value once more. 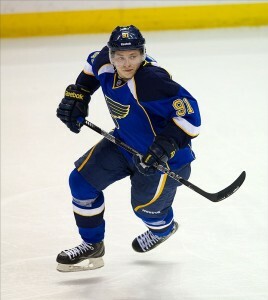 Tarasenko, who hails from Yaroslavl, Russia, was the 16th overall pick in the 2010 NHL Entry Draft. He was selected just two picks after fellow St. Louis rookie Jaden Schwartz, in a draft slot originally owned by the Ottawa Senators. Before the NHL got underway this season, Tarasenko was biding his time in Russia’s Kontinental Hockey League with St. Petersburg SKA. The team also had NHLers Sergei Bobrovsky and Ilya Kovalchuk on its roster. In 31 contests with the team, Tarasenko averaged exactly one point per game. Since coming across the pond to St. Louis, Tarasenko has received more opportunities to display his talents, and so far, he hasn’t disappointed. Check out his second goal against Detroit where he splits the defensemen, goes backhand-forehand, and puts it high-blocker on Red Wings netminder Jimmy Howard. Tarasenko has also been given time on the powerplay, something only the best NHL rookies receive from their coaches. “Vladi’s playing really, really well right now,” Blues head coach Ken Hitchcock said following their win over Nashville. The right-winger has the confidence of his coaches and managers, and we’re not just talking about real hockey. Tarasenko has been one of the most popular players on the fantasy hockey waiver-wire, and is being quickly snatched by teams in nearly every fantasy league. Tarasenko’s icetime has also been solid, with the rookie playing an average of just over 14 minutes in his first two regular season games. All signs point to a shortened season of exciting Blues hockey, and Tarasenko should be a huge part of it. Following a Blues’ goal against Nashville, a tight-angle shot from Alex Pietrangelo, Tarasenko celebrated like he was Mike Foligno, jumping up and down in front of the St. Louis blueliner. The passion is there, and Blues supporters are thrilled with his performances in the first two games. Keeping up the pace is the challenge, but Tarasenko has established his name as a player no team should be taking lightly.